The original Crash Bandicoot came out the day before my 11th birthday, just under 21 years ago... scary thought. It shot Naughty Dog, these days known for the Uncharted series and The Last of Us, into the big leagues. At the time Crash Bandicoot changed the standard of what platform games could do. No longer just going left to right, but now into and towards the screen. This may seems silly now, but in 1996 we were still waiting for Mario 64. While we've had a lot of HD remasters, for the newer gen consoles, they've mostly just been slight upgrades to textures and framerates. 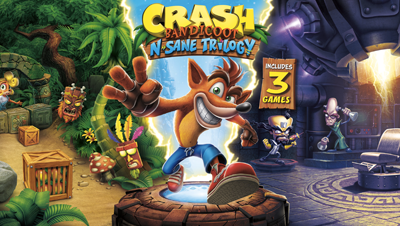 Crash N. Sane Trilogy has been remade from the ground up. Looking comparable to high budget CGI animated movies and yet somehow still feels familiar, like there was no gap in time. Crash faceplants N. Sanity Beach and, a happy, nostalgia kicks in as he shakes himself off and you run into the jungle, jumping and spinning your way through, picking up apples and smashing boxes. Ahh, the 90's. Vicarious Visions, Best known for making Skylanders ports and the port of Doom 3 for the Xbox, went all out and not only remade the original, but also Crash 2 and Crash 3: Warped. Coco, who was introduced in Crash 2 (but not playable until the third game, and only during certain stages), is now a playable character for all three games, changing things up slightly. Obviously there has been a lot of improvements to character models and animation, yet they manage to keep it respectable to the original aethstetic. All the original idol and comedic death animations remain. Levels have been massively overhauled. Where a green texture once passed for grass at the side of a stage, is now fully modelled grass and foliage. Dynamic lighting and shadows are used to create, and sometimes change, the mood of a level, along with some new weather effects. The small touch of footprints in the sand (and snow) was welcomed. (Something Infamous: second son didn't do... not that I look for these things...). The analogue stick can now be used for movement (Crash out dates the Dualshock controller) but I often found myself reverting back to the D-pad for more accuracy, jumping box to box or across gaps, in some of the more precarious sections. Counter to this, there are now extra Checkpoint boxes throughout the levels. Usually placed before and after trickier parts. Dying multiple times from a Checkpoint will now get you an Aku Aku mask, to aid you. The Bonus Stage save system has been replaced with a more forgiving Autosave and the game seems more generous with the amount of Extra Lives you’ll pick up, in general. The game (on base PS4) runs at 1080p and mostly holds to its 30FPS (frames per second). While the PS4 Pro runs at a higher 1440p, so not quite 4k, and holds the frame rate with ease. The PS4 Pro also has a few other little touches, like, better shadows and some extra lighting occlusion tricks. Both versions look great, though. While everything I've said is positive, there are a few small things that let it down. An old teaser trailer had the game running at 60FPS. This would have been nice for both the animation and responsiveness to controls, but I guess it was scaled back due to technical limitations. The playstation originals also ran at 30FPS, so maybe it was also to keep the feel of that. There is a lot of loading screens... A lot. These aren't CryEngine long, (looking at you, Prey), only around 8-15 seconds. The title screen needs to load, you press start and then it loads again so you can pick which game you want to play... and then that loads.... Then you're loading between levels and the hub world. This doesn't affect the game play, but can get slightly tedious. Collision detection (and hitboxes) can be an issue at times, often missing the edge of a platform, getting hit by an enemy or stage trap, to no fault of your own. Most basic of all, Crash will sometimes have a problem doing something as simple as jumping on top of a wooden box. One of the main things you’ll be doing a lot of in this game. While the game is great for fans of the originals, like myself, I'm not sure how a newer audience will accept it. This is a 20 year old platform game and plays like one. For good and bad. Bring on a Remake of Spyro, next, please.